If you are a secondary school educator interested in advancing into leadership roles specializing in teaching social studies, pursuing a master's in social studies education is a sensible choice. Social studies is among the most competitive of endorsement areas for teachers; obtaining a graduate degree in the field can improve your career prospects. According to the Bureau of Labor Statistics, projected job growth for high school and middle school teachers is 8% through 2026. Furthermore, graduates who hold master's degrees may also become eligible for state-issued permanent or professional social studies teaching certification for grades seven through 12. A master's in social studies integrates pedagogical and content coursework from many disciplines, and provides a strong foundation for career advancement. Sample core coursework for a social studies degree includes global citizenship, history and sociology of American education, gender and ethnicity in education, and technology to advance learning. Pedagogical coursework also includes techniques in social studies, materials and methods in social studies, theories of teaching and learning, contemporary educational thought, social studies lab work, social justice, critical pedagogy, media and popular culture, and educational research methods. Programs are typically 30 credits including a capstone, take two years to complete, and give equal emphasis to subject matter and pedagogical methods. Many programs allow for six to nine elective credits, allowing you to select courses to suit your interests. Graduation requirements for most programs include a portfolio, a thesis defense, and an applied experience requirement in which students demonstrate effective teaching practices. If you have a background or a certificate in museum studies, transfer credits may also be applied toward a master's degree program in social studies education. To help you gain a competitive advantage in the job market, you may also consider obtaining a teaching endorsement in another area, such as language arts. Pennsylvania State University World Campus ranks #1 on The 10 Best Online Master's in Social Studies Programs! Penn State graduates are employed in some of the country's best school districts, educational organizations, and leading corporations, and for good reason: a master's from the Penn State College of Education builds expertise in K-12 school subject areas and enhances professional development. The university's master's of education in curriculum and instruction with an emphasis in social studies is designed to give learners a well-rounded education while allowing them to pursue a specialized degree. Penn State's online program incorporates instructor commentary, assigned reading, audio-visual media clips, and interactive activities. Courses cover subjects such as public history and heritage studies, sustainability and ecology issues, and community engagement and student voice. While earning an online master's in social studies education from Penn State, students have the option of specializing in other related subjects, from media to literacy and the study of cultures and identity. The 30-credit online master's in social studies education consists of ten courses, and most students earn their degree in two years. However, some may finish the program in as little as 15 months. Earning an online master's in social studies education opens avenues for educators interested in research careers, postsecondary institutions, and government facilities. On average, applicants have at least one year of teaching experience before entering the program, although experience is not required. Prospective students must provide GRE and MAT scores, in addition to a resume, writing sample, and statement of purpose. Penn State is accredited by NCATE/CAEP, APA, NASP, CORE, and CACREP. Pennsylvania Department of Education approves all of the college's professional education certification programs. University of Missouri ranks #2 on The 10 Best Online Master's in Social Studies Programs! Through research and professional development, University of Missouri-Columbia's College of Education has been improving educators' and students' quality of life since 1867. Mizzou's master's in social studies education is specifically designed to advance the knowledge and practice of teaching social studies through its rigorous, comprehensive curriculum. Serving over 1,300 graduate students in the past year, social studies education at Mizzou remains at the forefront of important discussions concerning the future of teachers and scholars. Consisting of 32 credit hours, the master's in social studies education online curriculum explores instructional methods and curriculum development through the lens of social science instruction. Electives address the effect of contemporary issues such as poverty, immigration, and youth culture in the classroom. A 3.0 grade point average is required in the last 60 hours of the appropriate preliminary degree, as well as evidence of at least two years of successful experience in an appropriate field. To be considered for the online social studies education program, applicants must submit GRE scores. The University of Missouri is accredited by the Higher Learning Commission. Others schools, colleges and departments are accredited by their appropriate accrediting agencies. Nova Southeastern University ranks #3 on The 10 Best Online Master's in Social Studies Programs! Based in Fort Lauderdale, Nova Southeastern University is a private, non-profit institution dedicated to educating future leaders and global professionals through its wide variety of progressive academic programs. Nova's master's of science in education with a specialization in middle grades or secondary social studies education is presented in a high-quality online format that promotes critical analysis of educational responsibilities. The curriculum for Nova Southeastern's online master's in social studies education provides educators with the skills, knowledge, and techniques to become effective instructors and develop engaging lesson plans. Courses in the 37-credit program are research-based, and examine sociological perspectives in our multicultural society, contemporary social issues, and teaching methodologies. The fully-online master's in social studies education is offered in an accelerated format using a cluster model, which groups students from various geographic locations together based on start dates. Each course is presented as an eight-week module. Applicants to the online master's in social studies education program must hold a bachelor's degree from an accredited institution, with a 2.5 minimum undergraduate GPA. A valid professional teaching certificate or temporary teaching certificate, as well as passing GRE scores, are also required. Courses in the Middle Grades and Secondary Social Studies Education specializations meet the Florida State Department of Education requirements towards certification or recertification. It is the responsibility of the student to contact their state department of education regarding certification, recertification, or endorsement requirements. The College of Education at Nova Southeastern University is accredited by the National Council for Accreditation of Teacher Education. New York University ranks #4 on The 10 Best Online Master's in Social Studies Programs! New York is a city of constant growth and innovation, and its intellectually adventurous and socially conscious atmosphere makes it an ideal place to pursue a graduate degree. New York University's online master's of arts in teaching social studies to grades 7 through 12 brings the city's cutting-edge outlook to students nationwide, using advanced technologies and an intensive, research-based curriculum to prepare distance learners for careers in teaching. NYU's master's in social studies education online requires 30 hours of coursework, which is divided into preparation, foundation, active practice, and peak teaching modules. 24 credits of active practice coursework introduce the fundamentals of curriculum planning and development, as well as comprehensive strategies for working with special needs students. Peak teaching classes detail the responsibilities associated with teaching, and how those duties influence the student-teacher relationship. Presented in a supportive cohort learning format, the program takes a year to complete. Graduates may then pursue a full-time paid residency in one of many high-need urban schools throughout the country. Applicants should hold a bachelor's degree with an undergraduate GPA of a 3.0, and should have previously completed 24 semester hours of coursework covering world and American history and geography. Prospective students may submit GRE or MAT scores, although there is no mandated score required for admission. Prior teaching experience is not required. New York University's teacher education programs are accredited by the Council for the Accreditation of Educator Preparation. University of Buffalo SUNY ranks #5 on The 10 Best Online Master's in Social Studies Programs! Offering an intimate, close-knit and interactive graduate experience, the University at Buffalo's hybrid master of education in social studies develops confident instructors who are skilled at managing dynamic learning environments and building comprehensive curricula. Intended for current or prospective teachers in New York state, the program leads to an institutional recommendation for professional certification. Comprised of 33 credits, Buffalo's primarily-online master's in social studies education can be completed in four to five semesters. On-campus classes are held in both day and evening sessions. Major coursework emphasizes literacy acquisition and contemporary research in social studies, and students may fulfill the 12-credit elective requirement through classes in areas ranging from Asian studies to political science. In addition to 115 hours of field experience, degree candidates spend one full semester student teaching in a local institution. Applicants are expected to hold a bachelor's degree in history or one of the social sciences, with at least 21 completed credits of history or geography coursework, and should have completed at least one political science class and one course in economics as an undergraduate. Additional prerequisites may apply, depending on a prospective student's academic background. Along with unofficial transcripts, applicants to the online master's in social studies education program should submit their official GRE scores and proof of teaching certification. The University at Buffalo is accredited by Middle States Commission on Higher Education and the New York State Board of Regents. University of Pittsburgh ranks among The 10 Best Online Master's in Social Studies Programs! The University of Pittsburgh's Center for Teaching and Learning is known for producing educators according to the highest professional standards. Thanks to its Pitt Online division, students all over the country can earn their MEd in one of four specialized areas without setting foot on campus. Emphasizing research skills and fundamental theory, the master's of education with a concentration in secondary social studies education program is presented in a fully-online, self-paced format designed for working professionals who have previously earned an Instructional I teaching certificate. The 36-credit master's in social studies education curriculum is divided into six academic areas: social studies-specific pedagogy, psychological perspectives on education, social and cultural perspectives on education, a research seminar, research methods, and electives. The bulk of the program is spent examining topics in social studies-specific pedagogy, such as issues in history education and historiography, global citizenship, and comparative and global perspectives on education. Prior to graduation, students must pass a comprehensive written exam. Along with a teaching certificate, applicants should hold a bachelor's degree in social studies or a related social science, or have completed a significant amount of social studies-related coursework as an undergraduate. A minimum GPA of 3.0 is required for acceptance, although individuals with a slightly lower GPA may be admitted on provisionary status. The University of Pittsburgh is institutionally accredited by the Middle States Association of Colleges and Schools, Commission on Higher Education. University of Colorado Boulder ranks among The 10 Best Online Master's in Social Studies Programs! Committed to diversity, democracy, and justice, the University of Colorado Boulder strives to develop informed and innovative instructors, community leaders, researchers, and role models through its cutting-edge degree programs. Combining efficiency and experiential learning, CU's secondary master of arts and science licensure program allows candidates with a bachelor's degree in any liberal arts field to pursue a master's in social studies education. Requiring 44 to 45 credit hours, CU Boulder's online master's in social studies education addresses the nature of social studies and social studies education, adolescent psychology and development, and the effective use of subject- and age-specific methods and materials. Coursework is divided into content, cumulative, and education categories, and all content coursework must be completed prior to the start of the second fall semester. Licensure candidates must maintain a 3.0 GPA in all three fields. The program culminates in a student teaching experience, in which learners apprentice in a local secondary school. In addition to a bachelor's degree from an accredited institution and minimum undergraduate GPA of 3.0, prospective students must hold a valid teaching license. GRE scores are not required for the MA+ program, but applicants are expected to provide documentation of at least 25 hours spent working with young people in some capacity. CU Boulder is accredited by the Higher Learning Commission. 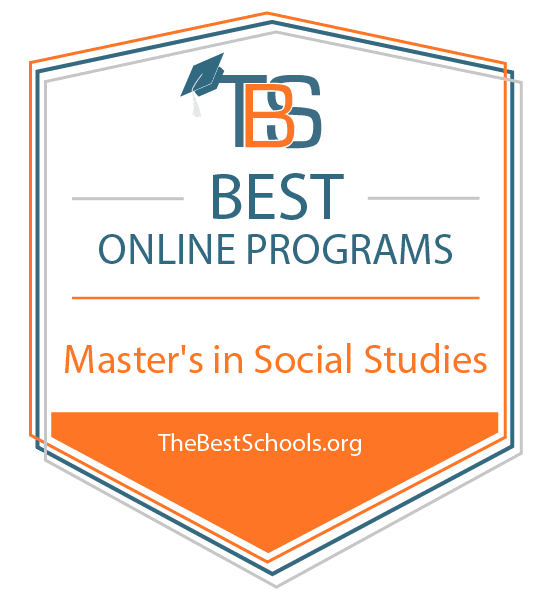 University of the Cumberlands ranks among The 10 Best Online Master's in Social Studies Programs! For 125 years, the University of the Cumberlands has championed both intellectual and spiritual growth, encouraging students in the pursuit of leadership and service as well as education. Based in Williamsburg, Kentucky, this Baptist institution offers a convenient, web-based MAT in middle school and secondary education in social studies program for current and aspiring teachers nationwide. In addition to state licensure, UC's online master's in social studies education provides the foundational knowledge and experience required to effectively lead in the classroom. Presented in a collaborative online environment, the program combines web-based coursework with hands-on field experience. Courses address topics in classroom management, instructional design, and current trends in special and secondary education. While distance learners may earn their master's in social studies education from any location, the program places a strong emphasis on experiential learning, and students must complete a period of supervised student teaching at a local institution. On average, most students earn their master's in social studies education in around 18 months. Graduates living in Kentucky may seek certification through the Education Professional Standards Board. Applicants may transfer up to nine hours toward the master's of social studies education program, and should hold a bachelor's degree with a GPA of at least 2.75, or 3.0 in the final 30 hours of undergraduate coursework, in addition to GRE or the Praxis CASE scores. Those specializing in secondary or all-grade instruction are required to have completed at least 30 credit hours, or a major, in their desired area of emphasis. is also required. University of the Cumberlands is accredited by the Southern Association of Colleges and Schools Commission on Colleges. SUNY College at Brockport ranks among The 10 Best Online Master's in Social Studies Programs! Part of the renowned State University of New York system, SUNY College at Brockport offers more than 50 graduate programs, including a master of science in education: adolescence social studies that can be completed entirely online. Drawing from contemporary thought in history and anthropology as well as pedagogy, its curriculum explores the roles of diversity and democracy in education, while developing fundamental skills in research, assessment, and critical thinking. Designed for instructors who are either pursuing or currently hold a NYS teaching certificate in social studies grades 7-12, the 30-credit program includes five major courses and four graduate-level history courses of the student's choosing. Coursework addresses current issues in social studies, educational assessment and evaluation, and diversity in education. Prior to graduation, students must complete training mandated by the Dignity for All Students Act. Degree candidates must be enrolled in a consistent manner, completing at least one graduate course every 12 months, and have a total of five years to earn their master's degree in social studies education. Graduates are eligible to apply for a New York state teaching certification, and may seek assistance through Brockport's certification office. SUNY College at Brockport is regionally accredited by the Board of Regents of the University of the State of New york and Middle States Commission on Higher Education. Concordia University - Portland ranks among The 10 Best Online Master's in Social Studies Programs! The field of social studies encompasses more than just history and geography; it also creates empowered, active participants in a global community. Concordia University-Portland's MEd in curriculum and instruction: social studies (K-14) program encourages the development of an energized classroom environment, in which instructors demonstrate the power of critical thinking in a globalized world. Offered entirely online, with no field or practicum requirement, Concordia's program emphasizes diversity, a clear understanding of moral leadership, the ability to identify and adjust to various classroom environments, and effective curriculum development methodologies. Over the course of 30 credit hours, students earning a master's in social studies education explore character-building curriculum plans, contemporary educational thought, and major theories in teaching and learning. Students must take one educational research course. The program culminates in a capstone experience, which may take the form of practitioner inquiry, action research, or a written thesis. Although the program does not lead to state certification or licensure, those who hold a master's in social studies education may look forward to potential salary increases and more career opportunities. Graduates with an online master's in social studies education go on to work as higher education instructors, educational program directors, and social studies division or department chairs. Concordia University is accredited by the Northwest Commission on Colleges and University as the undergraduate and graduate levels. While the majority of graduates of online social science master's degree programs teach in secondary schools, alternative career paths include educator roles in museums, educational consulting, tutoring for individuals or businesses, and creating curricular materials for organizations. Some teachers at the master's level also pursue program facilitation and educational administration roles. Middle School Teacher: Middle school teachers instruct students at the secondary level , which usually means grades six through eight, but sometimes includes fifth or ninth grade. They teach lessons and supervise activities that build on earlier foundations and prepare students for high school. Bachelor's degrees and state licensing are required for teachers in public middle schools. High School Teacher: High school teachers instruct secondary students in ninth through twelfth grades, building on the lessons learned in middle school and preparing students for college and employment. They plan and teach lessons, supervise activities, conduct assessments, and grade assignments. Some teachers, particularly at the master's level, advance into educational administration. Museum Worker: Museum workers and educators plan, research, design, build, and maintain museum exhibits and collections. They also develop and administer community outreach programs, lead events, present at conferences, conduct tours and gallery talks, train tour guides, organize interactive workshops for guests,and oversee and coordinate production of educational program materials, including training manuals.